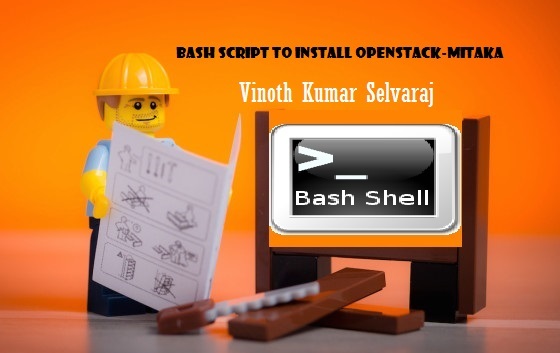 Bash script to install openstack-Mitaka in ubuntu 14.04LTS – Helloooo…. Vinoth …! – Use this script in the fresh ubuntu 14.04LTS machine. – Must have static IP configured. – This script used the same NIC/IP for Management/External/VM Datapath networks. – Make sure that the IP you have given must have internet connectivity. – The interface name must be the NIC name of above-mentioned IP. Wow, great script! Saved me a ton of time. Went really smooth. Really great job, thank you for sharing it! Do you know what is the login credentials for Horizon after install (domain, user, pass)? After the successful install, You could find the admin-openrc file in openstack-mitaka folder. You can see the login details in it. Thank you Vinoth. Really good script. Hi, I can install openstack with your script. But, I can’t access the amin console of above credential.could you please help for me? Great script. How can I remove the references to hellovinoth.com and the horizon logo? Also, can you provide the steps to install the Heat service.. Trying to do this manually I am getting heat database communication errors. How policy,json is calling in your script ? Awesome work, I am just now getting in to the OpenStack cloud realm, this did make my journey a little easier I have installed and re-installed with several other tutorials but this was very nice. I have a question is it possible to add compute nodes to this if so how do I go about doing that. Thanks Again for your tremendous effort and work. Sorry I just saw that this morning, I am going to give it a try today, THis is an awesome script, I am really looking forward to it. Why am I getting a db error in this script? So I am just wondering if I have something wrong or is this a bug in the script? It also removed ntp from the install as well, why? I noticed that I don’t have the app catalog and the Volume/Storage manager, do you know to enable those or do you know where i can get step by step instruction to install/enable them? Thank you very much for this it worked great I now have the controller and 2 compute nodes. Great work Vinoth . I was able to execute scripts. However the dashboard is not loading . I guess the context path is set to / . so I just need to invoke the IP via browser rt ? Please make sure you gave IP address that can be accessed from your browser and its NIC name during the scrip execution. No need to restart the individual service since rebooting will do so. Thanks Vinoth – Dashboard still not working . However , I downloaded horizon srouce and able to connect to keystone That essentially means that the all-in-one setup is working ,with the exception of horizon .. I can use CLI instead of horizon . On a different note – in your script mitaka_package_install.bash , you are doing apt-get and installing each services seperately . By any chance , you have a script which downloads , for eg : nova , neutron and keystone source from git , then builds the system ? After I did the install it was working but I rebooted the vm and now I can open the main login webpage, please can you confirm the full path? There doesn’t seem to be any way to add/create a Volume in the web UI. Is there a way to enable this? How can I add swift and heat to this install? Swift and Heat services installation are not in the script. So you need to follow the upstream docs.openstack.org for adding those services. You are doing a great job !, I have referred multiple sites but i haven’t get any concrete answer for this. What is the minimal hardware requirement to experiment with openstack ? I wanted to install devstack in my laptop i3 6GB, if i use linux continers to host will there be any performance improvement. To run only the OpenStack core components (Keystone,glance,nova, neutron), 4GB RAM / 30GB HDD is sufficient . if you feel your machine is still alive, you could add Cinder service also. Yes, Containers will give you comparably better performance than VM. Great Script. Saved me a ton of time and frustration. Thank you! Has anyone figured out how to add the App Catalog or the Volume/Storage manager yet if so could you please share the steps you used to accomplish this? I am giving this shot again, Has anyone figured out what the interface url is so I can login to this? I would really love to try this out but the steps to get logged in and management is lacking…. Thanks Still a great script Vinoth good job. I am back and I have finally got this installed. However when I try to create and instance I get an error, where is the log located so I can see why this is happening? An unexpected error has occurred. Try refreshing the page. If that doesn’t help, contact your local administrator. will this create dpdk virtio / or native virtio instances?